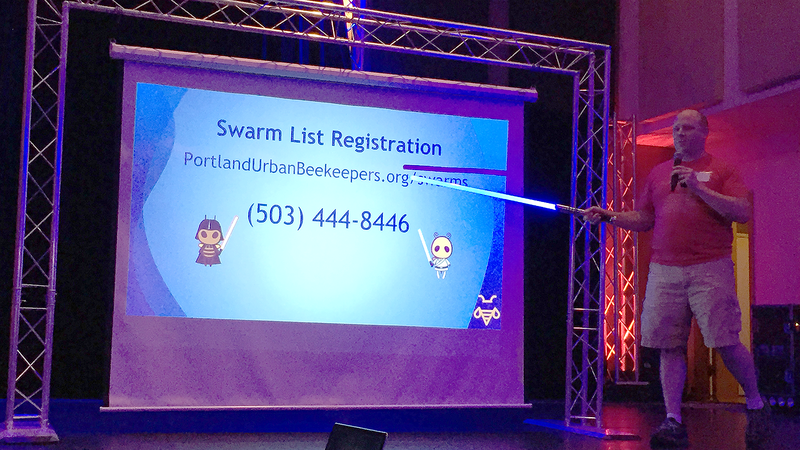 The following article was written by Tom Unger, Oregon Region Communications with Wells Fargo, regarding recent connections made between Wells Fargo and Portland Urban Beekeepers at their Eco Fair. Reprinted here with permission. BEAVERTON — The [Wells Fargo] Barnhart Center is usually a beehive of activity as our team members are busy as bees serving customers by phone. But last month the center was the site of an actual swarm of endangered bees and our Green Team team members jumped in to save them. 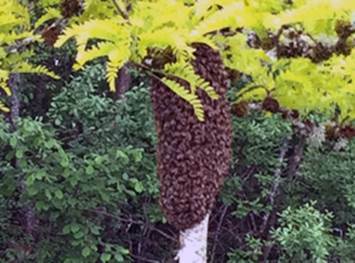 Two team members first noticed the swarm on a tree near the call center’s patio on April 26. They told Sandra Busch, a member of the center’s Green Team. She informed JT Davis, secretary of the Green, who reached out to Bob Wayman, a CBRE building maintenance technician based at the Barnhart Center. Bob checked out the swarm before leaving work that night. “It was very small at that point, about the size of a racquetball. I was thinking maybe they would take off and go to another area. When I came back early the next day, it had grown to the size of a basketball,” Bob said. There is a middle school near the Barnhart Center and one of its staff members was about to spray poison on the bees. Bob intervened and told him not to. 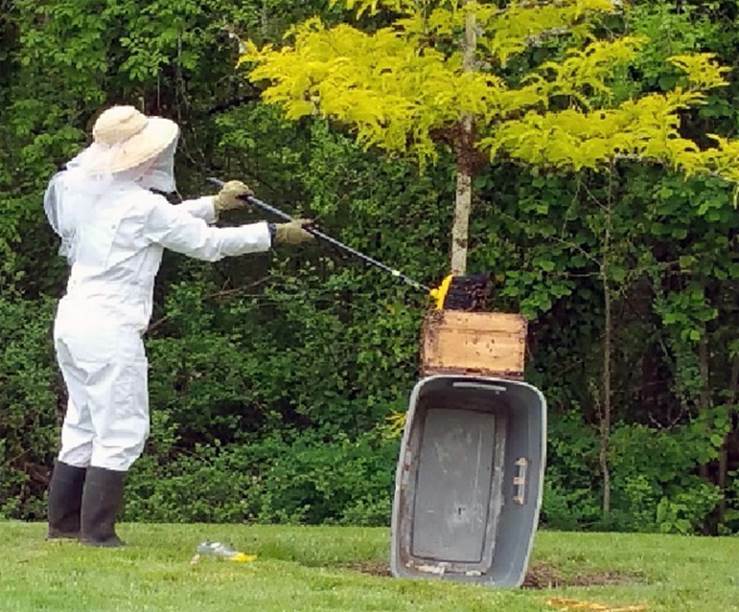 Luckily, the Beaverton center had held its annual Eco Fair last month where the participants included two beekeeping groups. 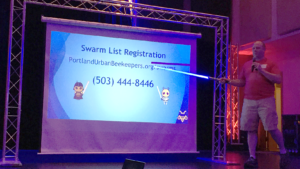 The groups had passed out cards with the phone number of a “Swarm Hotline” (staffed by a network of bee associations throughout Oregon). The network locates and contact beekeepers closest to where a swarm is located. Bob called the hotline around 6:45 a.m. on April 27. He used the phone keypad to enter the center’s address and phone number into the automated system. A woman beekeeper in Hillsboro [Lynnea L-K] called Bob within a few minutes and was on site by 8 a.m., Bob said (see photo below). “When she came out, she was amazed at the size of the swarm. There were probably around 4,500 to 5,000 bees there,” Bob said. “I thought it was great that through the Eco Fair, we made a connection we might not otherwise know about and then were able to reach out and get help for an unusual situation,” said Operations Processor Debra Kennedy. Bob remained on scene the entire time to warn team members to stay away. He also asked the school to keep the students inside their building. The beekeeper had a wooden container. She sprayed a mixture of sugar water and honey into it and to coax the bees into the box, filling it completely (see photo below). “She was very nice and answered a lot of questions from curious team members,” said Sandra. At one point during this two-hour process, the bees started swirling in the air between Bob and the beekeeper. The bees were so thick that Bob couldn’t see the beekeeper standing only 10 feet away. “I was covered with bees all over my shirt and hair for about 45 minutes,” Bob said, adding he got stung a couple of times. After the beekeeper got all the bees into the box, she taped it off to keep curious bystanders from getting stung. She came back early the next morning to take the bees to her home where she has a few beehives. 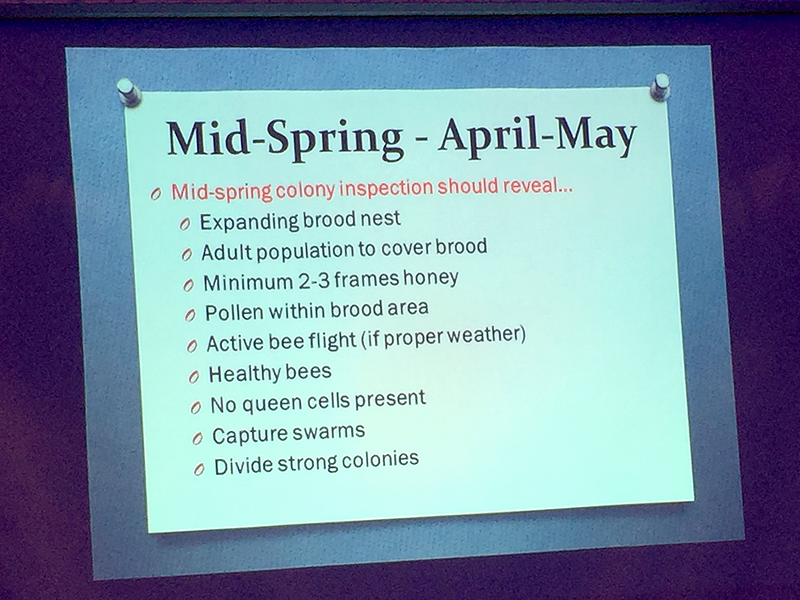 The following information is a new requirement (as of 2016) for beekeepers in the state of Oregon with 5 or more hives. Please note it does not replace or change Portland’s permit process. Any beekeeper; whether backyard, hobbyist or commercial; who had 5 or more hives (not including nucs) during the previous (last) year is now required to register with the Oregon Department of Agriculture (ODA). This is the result of House Bill 3362 which modified Oregon Revised Statute(ORS) 602 and the subsequent adoption of Oregon Administrative Rules (OAR) 603-055 by the ODA. The registration fee is $10 ($20 after July 1) and 50 cents per hive. The registration is for one year and must be made each year if the beekeeper had five or more hives during the previous year. The registration runs from June 1 to May 31. Previously only those beekeepers engaged in commercial pollination were required to register and the moneys collected by the ODA went into the agency’s general operating budget. The new law and rules make it clear that the monies from the new registration fees “shall be spent on pollinator research that is predominantly focused on honey bees.” The ODA agreed with the OSBA that most (all) of the collected monies will go to the Oregon State University (OSU) Bee Laboratory and the ODA will not use any of the monies for their administrative costs. Members of the OSBA met with the ODA and requested that specific language for our agreement be included in the OAR. The DOA proposed the addition, but the Department of Justice (DOJ) attorney assigned to the ODA said the agency did not have the authority to include it in the OAR. Nonetheless, the ODA said it will honor the agreement and look to adding the language to the ORS in the future. It should be noted that the ODA not only will not receive any monies for administrative costs but also there will be no monies for enforcement (at least at the present time). This does not mean you should ignore the law as it is a legal requirement and there are benefits to registering. Registering might serve to strengthen your position as a responsible beekeeper should a legal issue arise. In addition, you will receive notifications from the ODA on matters relating to beekeeping, such as the registration of a new Varroa mite control and the monies will go to OSU for research on honey bees. You may register on-line or by mail by going to the Apiary Registration page and filling out on line or downloading the application form. You may also request a hard copy by calling the ODA, Insect Pest Prevention and Management Program at 503-986-4636. When counting the maximum number of hives (not including nucs) that you had, you look to the previous or last year when registering your hives and as of now, that period ran from June 1, 2015 to May 31, 2016. The registration year is not the same as the calendar year because the registration year begins on June 1 of the current year and runs until May 31 of the next year. 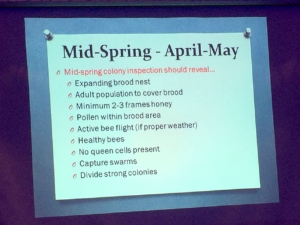 The registration year was chosen to better accommodate commercial beekeepers who may not know the maximum hives they have until the following spring.